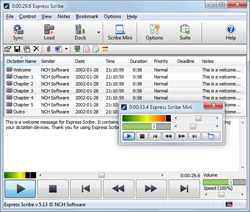 Express Scribe Free Transcription Software assists to transcribe audio files. Express Scribe Transcription Player Free helps typists by installing on the user's computer and connecting to a transcription foot pedal or keyboard. Express Scribe Transcription Player Free offers valuable features for typists including variable speed playback, multi-channel control, playing video, file management, and more. Express Scribe Free supports common audio formats including WAV, MP3, WMA, and DCT. Increase your words per minute by giving your feet control of playback, leaving your fingers free to type. Juke That, your Party Jukebox with Auto DJ, wishes, Karaoke, synchronize. MegaMind TagEditor is a far-reaching metadata processor for music files.